When we moved into our previous rental home in January of 2010, I wrote a post about how each home speaks its own language, and dictates, in a way, how it should be decorated. I know I'm not alone in this feeling, and just the other day I read a post here, about the very same topic. 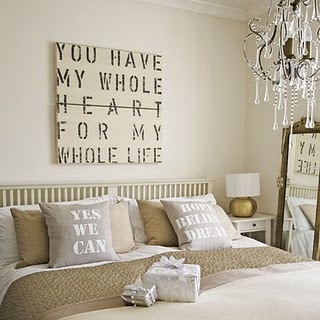 Each home has a unique personality, and although the same pieces can be used from house to house, the way they are put together and accessorized definitely changes with the feel of each home. The home we just moved from had a definite Tuscan vibe, but it was also small scale and cozy, so I was able to go with a sophisticated cottage feel and it worked. This house on the other other hand, although slightly smaller in square footage, is grander in scale, and a bit more contemporary in feel, and that same cottage decor just won't work the same way here. As I opened a few boxes of decor and looked inside, I was really interested in the fact that the accessories just didn't "feel" right for this house. Proof positive that there is such a thing as "house speak" - the ability the house has to communicate with you. And I am excited for the possibilities that this house has to offer. To quote myself from the post about our last house, "let me define my own personal style for you. After taking a quiz over at Sproost, I decided to call my style Rustic French Beach Cottage, although I have a decidedly urban flare especially in my artwork choices. You all get the picture. 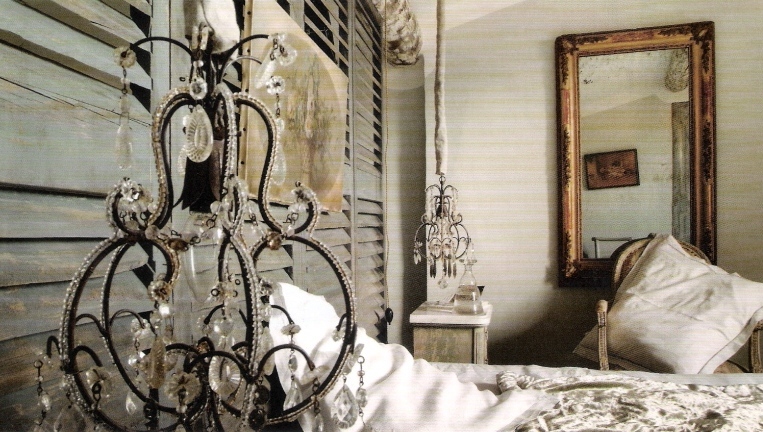 I am drawn to pale tonal palettes. 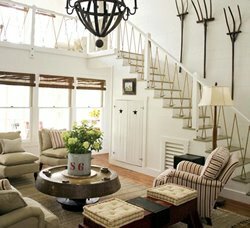 Textures such as beadboard and burlap. Old, timeworn pieces. [A soft, industrial feel]. These are the things that make my heart go pit-a-pat." And I think this house will lend itself well to this style. When I saw my furniture pieces sitting in the space, I got a sort of Restoration Hardware vibe. I like it...and I'm going to use that feeling as a jumping off point. Just to give you an idea of the space, here's a photo I snapped of the dining area (my favorite area in the house because of the HUGE windows.) Please disregard the mess...you can tell we're definitely just moving in, but you can get a feel for the high ceilings, the large windows, the open feel. I like the way my table, chairs and buffet feel in this room... I think we're off to a good start. I hope you'll all join me as I transform this house into a home! Love this post. The tonal is so comforting, so relaxing. Question - why do you guys move so much. Is hubby in the military? Hi Irene, Actually, this move wasn't our idea. We were renting a house, and the homeowners decided to sell it. Since my hubby was in a bad car accident last year, we weren't in a position to buy the house, so we had to move. And here we are. That new dining room looks beautiful! Can't wait to see what you do with the place. We just moved two weeks ago but I am surrounded by oak and I hate it. Hard to get a vibe in here on what this house is speaking other than, please paint my trim white! Lol! Thanks for the great post! Holy Moly! I can't believe what you've gotten done aready. A new house, what fun! Great post, good luck! Good Luck! I'm feeling the same way about our new house... We are still getting to know each other. Whatever you do I know you will make it beautiful! Looking forward to lot's of decorating fun! Wow, you've done so much so fast! Looking forward to watching your journey in decorating your home! I'm so excited to see a peek at your new place! I love the feel of the dining room & I completely agree with you about the Restoration Hardware feel. I'm looking forward to see what you do with this new house! So true what you say about things from a former home never quite fitting into the new one; which makes decorating the new one so exciting! How fun to decorate a new space. And this house I think you mentioned you can paint? Yay! Since I am renting as well, I find being able to paint really makes it a home! 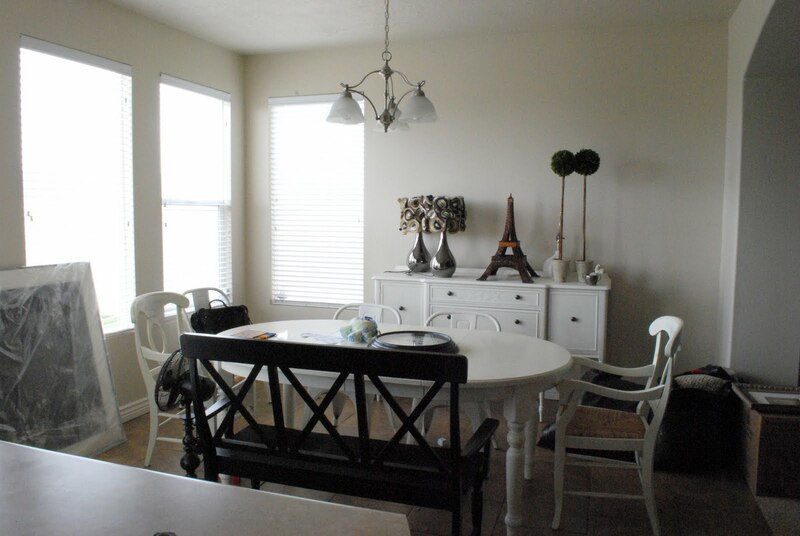 Love the dining room, can't wait to see it when you've decorated! If you don't mind my asking, where did you get the black bench? I have an identical one to it, which I stumbled upon on eBay for an insanely low price (I think $25) probably 5 years ago. I have been looking for a match ever since that one arrived and never found another one like it, though I'd love to have two. If you feel like sharing, I'd love to know where you got it. I like the look of the dining room already :). So bright, love all the windows. It's true, each home speaks its own language..i like the place of your dinning near at the window.